US #1310 was issued on the opening day of SIPEX. 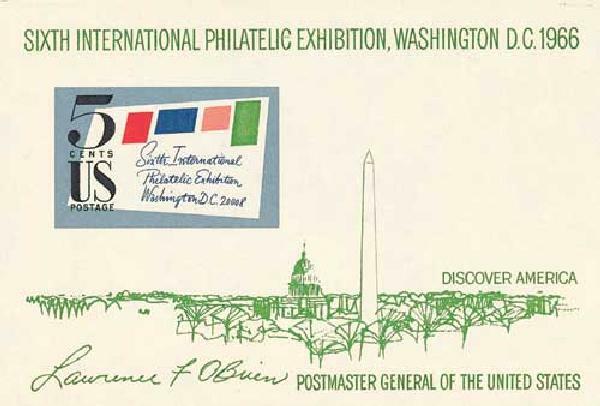 On May 21, 1966, the Sixth International Philatelic Exhibition opened in Washington, DC. All five previous US international philatelic exhibitions had been held in New York City. Initially, SIPEX was also to be held there, but disagreement among the show’s planners nearly canceled the event. US #1310 – Plate Block First Day Cover. In the years leading up to SIPEX, some of the planners of the show had different ideas about how they thought it should be run. Some felt that because there were yearly shows that catered to the “popular collector,” SIPEX should be a more exclusive show of limited size. As these disagreements continued, the planning committee ultimately announced they would be unable to produce the show. US #1311 – At 5¢, this is the lowest-denominated US souvenir sheet. In the meantime, a new hall of Philately and Postal History had opened at the Smithsonian Institution in Washington, DC. This inspired local Washington, DC, collectors to form their own National Philatelic Exhibition, which was a great a success. 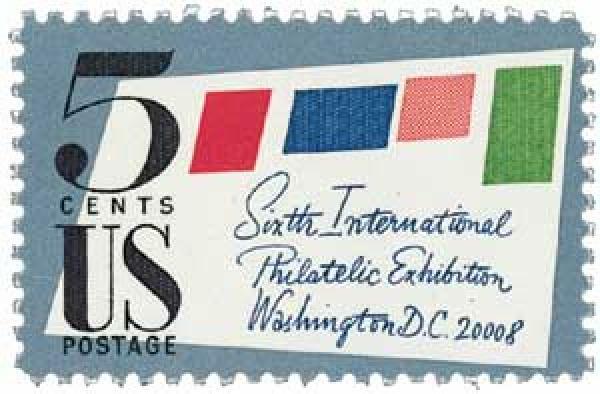 As they learned that the New York SIPEX was to be canceled, they offered to host the show in Washington, as long as they got support from the Association for Stamp Exhibitions. They succeeded in getting support from the ASE as well as the American Stamp Dealer’s Association and the American Airmail Society. 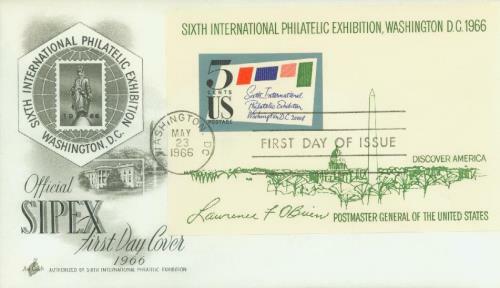 US #1311 – Classic First Day Cover. The group would have just 18 months in which plan SIPEX. Most exhibitions were planned years in advance, so it was a massive undertaking. But they managed to meet the challenge and SIPEX opened on May 21, 1966, at Washington’s Shoreham Hotel. During the opening ceremonies, Postmaster General Lawrence O’Brien addressed the crowd with a message from President Johnson and “a special word of welcome to the visitors from foreign lands who are here for this world-renowned exhibition.” He went on to encourage foreign visitors to explore other parts of America while they were there. 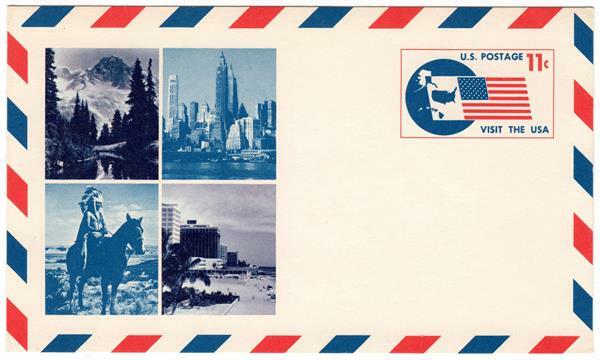 US #UXC5 was the first US international airmail postcard. Over the course of the show, the US Post Office held three First Day Ceremonies. The 5¢ commemorative stamp was issued on opening day, while the lowest-denominated US souvenir sheet ever was issued on May 23. A total of 1.2 million sheets sold in less than three hours and more needed to printed – totaling 15 million. 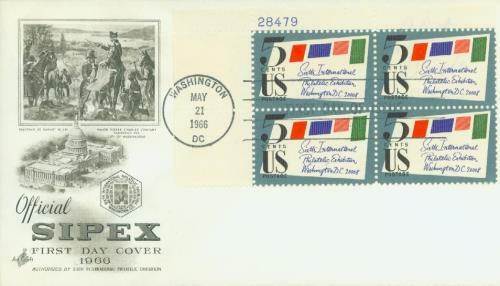 SIPEX was also host to a US postal first. 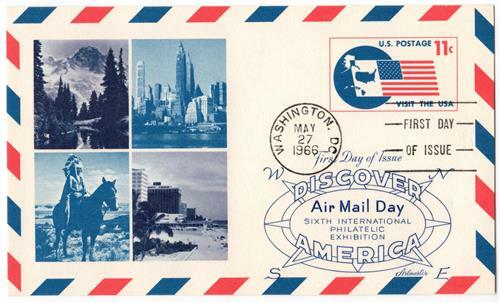 On May 27, UXC5 was issued, the first US international airmail postcard. It was also the first postal card printed in duotone. US #UXC5 – Classic First Day Cover. SIPEX attendees were also invited to visit the Bureau of Engraving and Printing for special daily guided tours. Back at the show, there were 80 dealer booths, including international booths from Belgium, Czechoslovakia, Hawaii, Japan, Lebanon, and Canada. Among the interesting items on display was the only known Canadian Postmaster’s Provisional – it was from 1851, shortly before the first Canadian stamp was issued. Prince Rainier III of Monaco also displayed stamps showing his nation’s history dating back to 1777. Among the popular US items on display were two full panes of US #292 (Western Cattle in Snowstorm), a very fine block of four C3a Jenny Inverts, and the largest known multiple of US #1 – a block of 16! The show came to an end on May 30 and was deemed a success by both planners and visitors. One Response to "This Day in History… May 21, 1966"